I’m having fun experimenting with pizza recipes! I’ve got another home run to share today. This pizza you’ll want to keep a fork close by because it’s LOADED with toppings. You can try and pick it up and eat it, but you may have some casualties! I present to you Chicken Pesto Pizza! It has pesto sauce in place of pizza sauce. Make your own pesto sauce or use the a jar of the store bought kind to save on time. I had a jar of Classico Pesto Sauce in the pantry so that’s what I used on mine. For veggies and herbs, I loaded it up with sliced mushrooms, white onions, cherry tomatoes and fresh basil. If you have leftover chicken, chop it up for your pizza. If not, bake two boneless, skinless chicken breasts and chop them up once they’ve cooled. I bought a small package of goat cheese with fine herbs to finish off the pizza along with a sprinkling of mozzarella cheese. It smelled so good baking in the oven! I had to stop myself from immediately grabbing a slice so I could take some photos. Oh the life of a blogger! My youngest daughter was not crazy about this pizza. I think she was turned off by the pesto sauce. She prefers the more traditional pizza with regular ol’ pizza sauce and pepperoni. Me, on the other hand, thought it turned out perfectly! For more pizza recipes, check out my recipes for Italian Meatball Pizza, Sweet Chili Chicken Thai Pizza and Cheeseburger Pizza. Have you tried pesto sauce on a pizza? 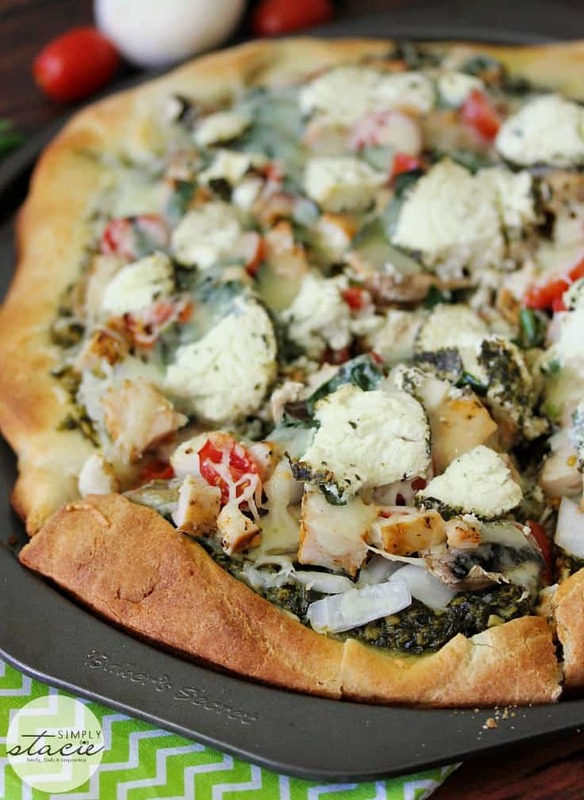 This recipe for Chicken Pesto Pizza hits the spot! Loaded with pesto sauce, fresh veggies, herbs and two kinds of cheese. You may want a fork for this one! 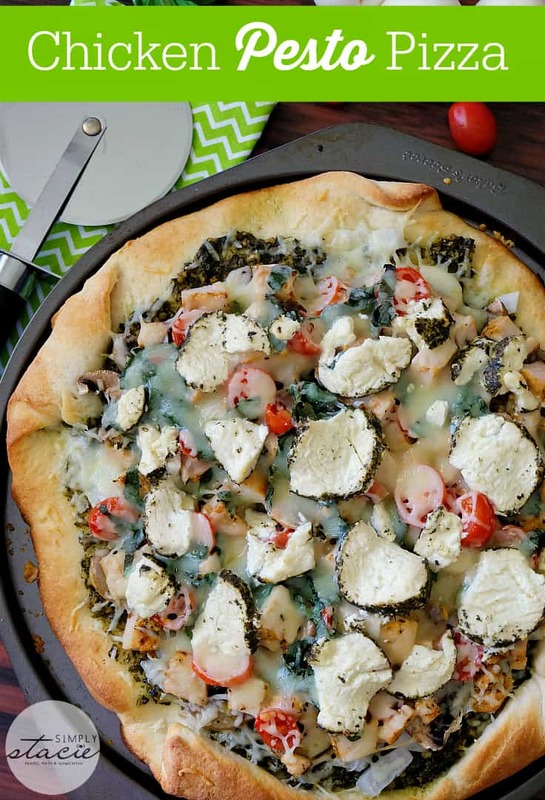 Spread pesto sauce evenly over pizza crust, leaving a gap around the edge. Evenly distribute onions, mushrooms, chicken, basil and cherry tomatoes over the sauce. Then top with mozzarella cheese and goat cheese cheese. Bake an additional 7 to 10 minutes or until crust is golden and cheese is melted. Want it right this second!! 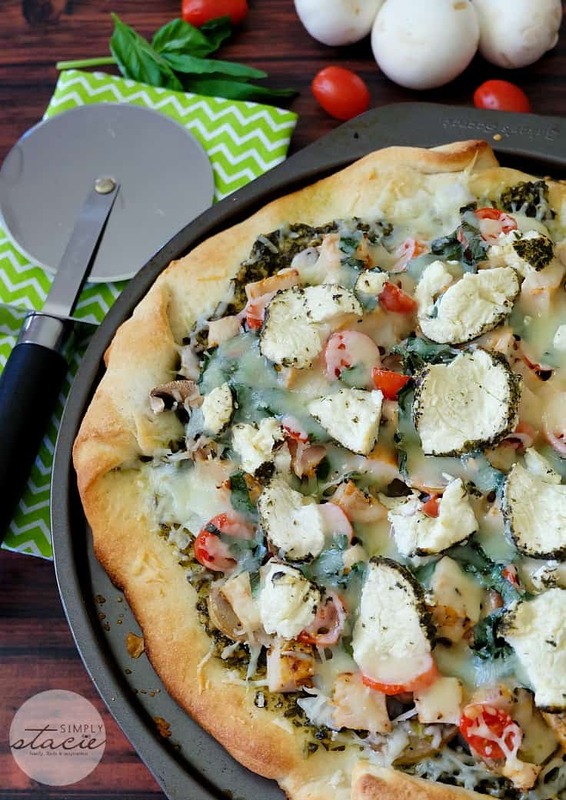 This is something fun to make with our homemade pesto! This pizza sounds delicious! Very different. I’ve never tried pesto sauce on pizza. An interesting take! Wow! 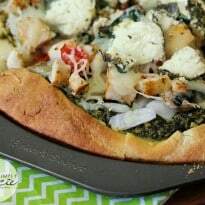 That looks fabulous and my family loves pizza.I am going to have to try this one for the gang.Thank you for posting it. This looks AMAZING! Thanks so much for sharing. 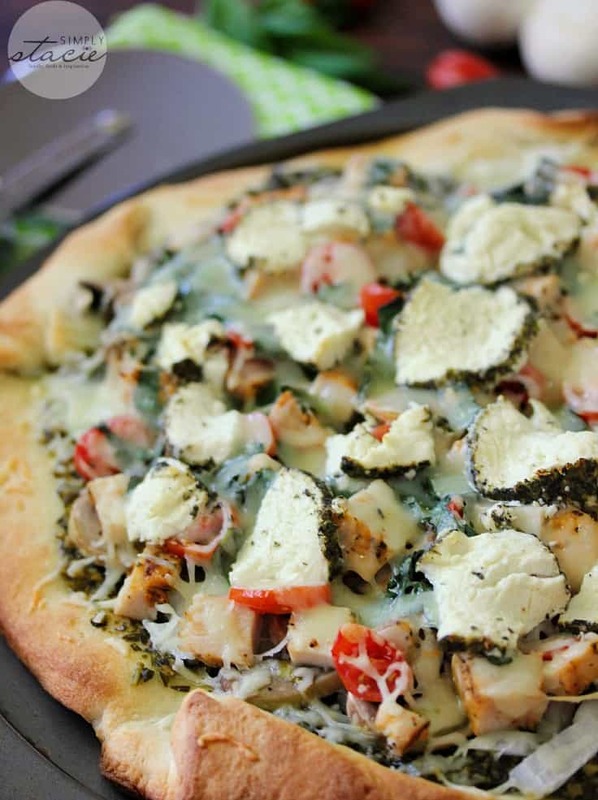 Chicken pesto is my fave…and on pizza? Delicious. Thank you so much for stopping by and linking up to Wonderful Wed. Blog Hop. 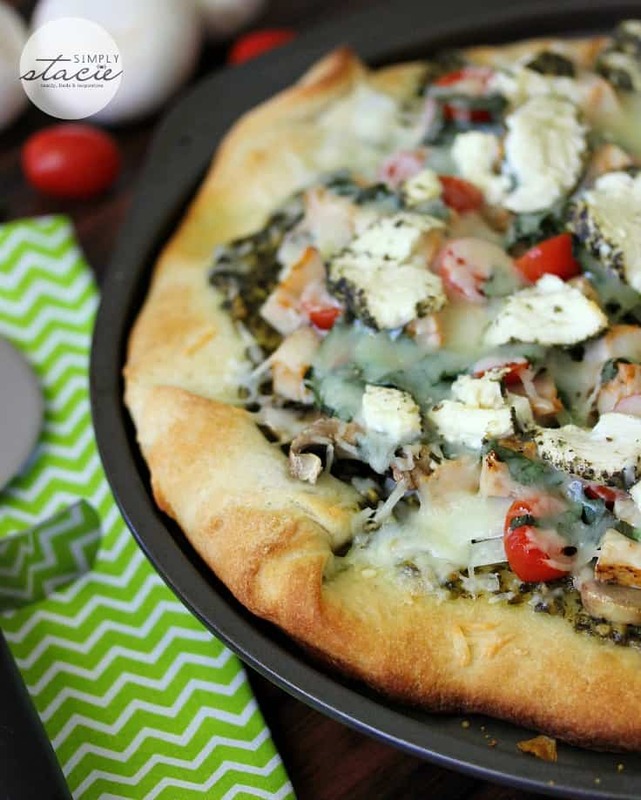 Your Chicken Pesto Pizza looks awesome and perfect for a party! Hope you are having a great Labor Day Weekend and thanks so much for sharing with Full Plate Thursday this week.